Facebook Messenger, WhatsApp, Skype, Slack, Viber, Telegram, Call Back, Email and more channels just in one button! Let customers choose their favorite method to reach you with 1 click and follow up the conversation anytime and anywhere! 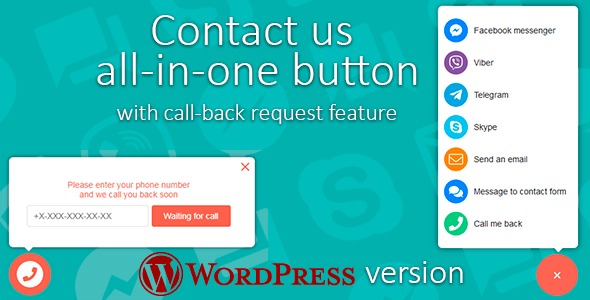 This plugin displays animated “contact-us” button on every page of your WordPress site. You can customize button position, button size, button color, menu size, button animation speed (please see configuration section to learn how to do this). If “prompt” feature is enabled, prompt messages will be shown to visitors. You can add many prompt messages. When customer click on this button menu will be shown. By default contact-us button displayed in the right bottom corner of the page. Last menu item opens callback request form feature. You can customize theme color, all texts and icons. You can display countdown timer when customer request a call-back.